First off, Happy New Year to everyone. I've been travelling the last week as we took a family trip to Northern California, but that trip was book-ended by a couple of great running events. 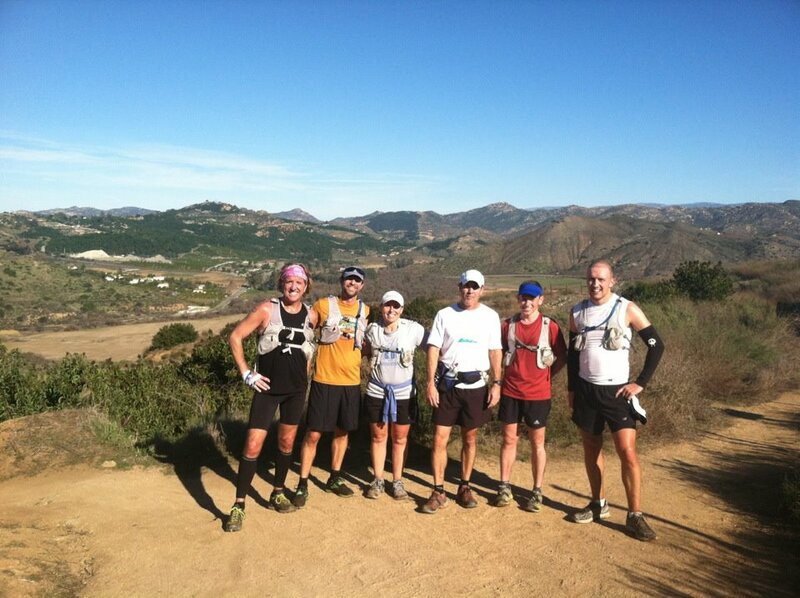 On New Year's Day, I hosted the Fourth (or maybe Fifth) Annual "No Puking on the Trail" New Year's Day Run. This year we had about 60 people show up and start the new year with a beautiful trail run followed by mimosas and an icy cold soak in the stream. This is always such a fun day and I can't think of a better place or better people to share New Year's day with, and I am happy to report that no one has puked (yet), but Jeff came close. My kids got three weeks off of school this year for winter break; I guess California can't afford to keep the schools open much anymore, so by week 3 the kids were alternating between bouncing off the walls and putting a strain on global internet bandwidth by streaming nonstop Netflix. We decided to take a short road trip to visit Sharlie, Ryan, Harrison, and my mom up in Palo Alto. I ran a great trail in Rancho San Antonio Preserve while my kids hiked to the farm with their grandma. The running terrain up there is so beautiful. I ran under a canopy of redwoods and on soft pine-covered trails, but my heart still belongs to the desert scrub and jagged rocks of Southern California. We visited the Stanford campus for my daughter's school project and of course we were all drawn to the track. The CamelBak coordination was not planned. You can't plan this kind of fabulous. Yesterday I was able to attend the first Rough Runner Fun Run, a benefit for an injured ultra-runner put on by Keith Swiatkowski and Christine Bilange. It was great to see so many runners rally for a good cause, and it was a good training day for me. I haven't run anything longer than about 15 since the Las Vegas Marathon, and with Death Valley Marathon a couple weeks away, I was starting to worry about my endurance. I ran a little over 20 yesterday and felt great. It's fun running with other ultrarunners because everyone talks about which 50 mile, 100K or 100 miler they are planning in the coming year and it almost makes what we do sound ordinary. One last thing; it was cool to be included here. I've always said I'm only doing this for the fame, accolades, and fortune. congrats on the blog ranking! even tho my passion as a "runner" is on the downhill slide, i always enjoy the stories, pictures and the pure joy you get from it. it is a great blog. Thanks Tadra. The passion comes and goes, but writing about running helps keep my motivation up. I'm glad you like the blog. Seriously awesome group to show up for a New Year's run! Wish I had know about this. Next year! Definitely come out next year, Jessica. I usually post the runs at meetup.com/runningmeetup, and we'd love to have you join us any time.